Florida online divorce attorney Jonathan Jacobs of the Jacobs Law Firm, offers divorce, paternity, and family law representation to clients across the Central Florida area. Often, clients choose a Florida online divorce lawyer to save on cost. Let’s face it, divorce and paternity lawsuits can be expensive, and that often prevents people who need to hire a lawyer from being able to retain an attorney. Locally, many couples choose to obtain an uncontested divorce in Orlando. Choosing to get an online divorce in Florida implies that both parties are in agreement on all issues from child support to timesharing to alimony to the division of your property. This means your divorce is uncontested (does not require litigation). An online divorce in Florida is not available for clients in every jurisdiction. It depends on whether a specific judge allows for the litigants to provide the Court with their divorce paperwork through an attorney. When a judge in Central Florida does offer an online divorce in Florida, Attorney Jacobs can assist you in getting divorced within 3 weeks after submitting your documents to the court/judge. It takes 1-5 days for the clerk of court to verify and process your paperwork, and then there is a mandatory (Florida Family Law Rules of Procedure) waiting period after filing your paperwork, for the court/judge to be able to grant your final judgment of dissolution of marriage. Does a Florida Online Divorce Require a Hearing? If your uncontested divorce necessitates a hearing, Florida online divorce attorney Jacobs will attend the final hearing with you. The final hearing itself lasts for only a few minutes, and it is more of a formality than a substantive hearing. Even so, Attorney Jacobs may need to wait for an hour or two with you while the court/judge entertains emergency matters from other cases, before calling us before the court for our proceeding. During this time, Florida online divorce attorney Jacobs will again explain as much about Florida divorce law as possible to help you understand your rights and responsibilities after the divorce is granted. How Does a Florida Online Divorce Work? Our first step in an is for you to fill out the required client questionnaire. This information will be kept strictly confidential except for purposes of providing the court with your information in mandatory court documents. Our client questionnaire is designed to get from you ALL of the information we may need to write your divorce documents and submit them to the court/judge. 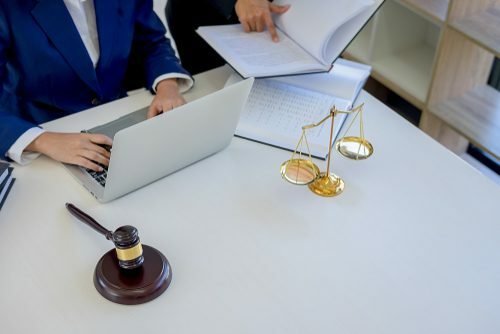 Step two is for Florida online divorce lawyer Jacobs to review your answers and information, after which he will draft your paperwork, ask you any questions that may help your case, and then speak with you in depth about your expectations and requirements. Step three is for us to do a final review of your documents to ensure they are accurate and truthful. The court requires honesty and transparency in dissolution of marriage proceedings. You may talk to your attorney by instant messenger, videoconference, by phone, or text. You are hiring an expert online divorce attorney. Your dissolution will likely go more smoothly and will be done properly. Your attorney will handle most of the process on your behalf. You can spend your time worrying about your life after divorce rather than about your divorce itself. Jonathan Jacobs, Esq. is a Florida Online Divorce Attorney representing clients in all of Central Florida.